I have thought much about wiring/rewiring the MGB as I have been left on the side of the road on several outings with no power. I had always heard the reason the British liked warm beer was because they all had Lucas refrigerators. The original wiring for the MGB is mediocre at best, with all the bullet connectors and just the way the wiring is run, it is a real pain. When my car was converted to the V8, not much thought was put into the wiring, other than running a wire across the top of the engine to the alternator and down to the starter bolt (more on this later) and a few other modifications to get it on the road. The Prince of Darkness hit me on one outing as I parked the car and went into a meeting for about forty minutes. When I came out and popped into the car to start it, I thought I smelt burnt rubber! As soon as I put the key, in I knew I was in trouble! No power, no lights, nothing! I opened the hood (bonnet) and saw that the wire running across the engine had hit a hot spot, burned the cover off the ten-gage wire and burn baby, burn! It burned all the coating off the wire, hit the starter block, and started burning into my wiring harness. The only thing that kept the car from burning to the ground was the connector burning off at the starter bolt from the heat of the burn. The wiring harness burned about a foot in each direction. My car is a 63 "B" and it only came with two fuses from the factory. Neither fuse blew! Well, after the tow home and looking at quite a mess, I knew there had to be a better way. I had been to one of the V8 events in Michigan and saw two different cars with no wires in the engine bay. I really liked the look, and this became my goal. I knew there had to be a better way than having a harness made with bad connectors and all its wires running by very hot headers. First, I pulled the entire harness out and studied the wiring diagram. What a pain! Dan Masters had a great idea of going to Kinko's and having the diagram blown up in size several times making it easier to read and follow the circuits. The first order of business was to eliminate the two fuse panel under the hood (bonnet) and go with new modern push type fuses vs. the old glass fuses. I looked at several options and selected the Comp9 by American Auto Wire (www.americanautowire.com). This gave me many fuses, some switched with the ignition on and some un-switched. Next came the tricky part of moving all the wiring connections from the original fuse panel in the engine bay to the passenger compartment. 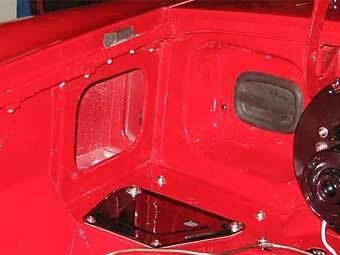 The goal was to eliminate the wiring out of the engine compartment and move it to a modern fuse box. The first thing I would suggest, beside blowing up the wiring diagram, is getting a label device with which you type the color and wire name and print it out and loop it over the wire(s). This will save you a lot of time later on identifying the wire(s) and to where or what it may go within the car. I laid the wiring harness out on my work bench, measured the distance from where I wanted the connection to the new fuse box under the dash, and built the wiring harness from those measurements. I wanted to keep the same color scheme so I ordered new wire from British Wiring (http://www.britishwiring.com) after I had laid everything out for the front part of the wiring harness. Some of the wires I upgraded by one gauge to allow better current capacity. The new harness from the Comp9 is routed through the same hole in the dash as the original, but with a twist. Instead of the wire harness coming into the engine compartment, I ran it through the inner fender area and cut a hole in the wheel arch brace. This allowed me to pull the harness through the inner panel and exit into the wheel well. I used black plastic conduit that has a split in it and used wiring looms to hold it in place in the wheel well. 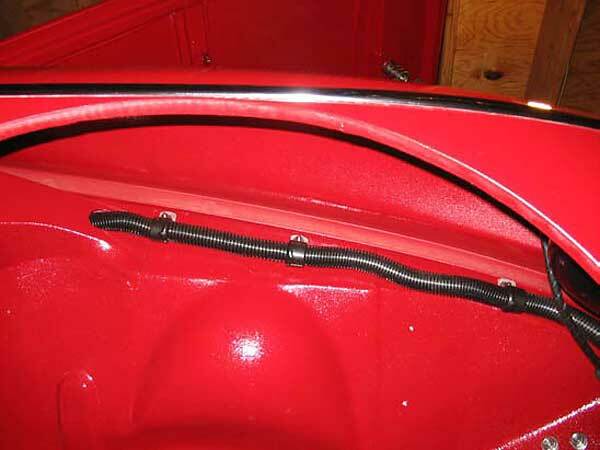 I used one of the original oil line holes in the front fender to bring the harness back into the front of the car. I re-routed the oil lines through the fender to a remote filter attached to the front bumper mount. Next was the rear harness. 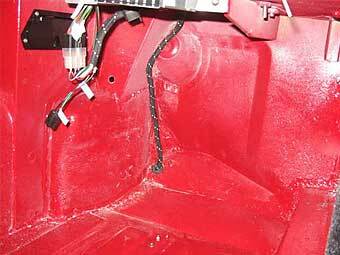 After much thought, I cut a half-inch hole through the front floor panel next to the transmission tunnel to route the rear wiring harness. 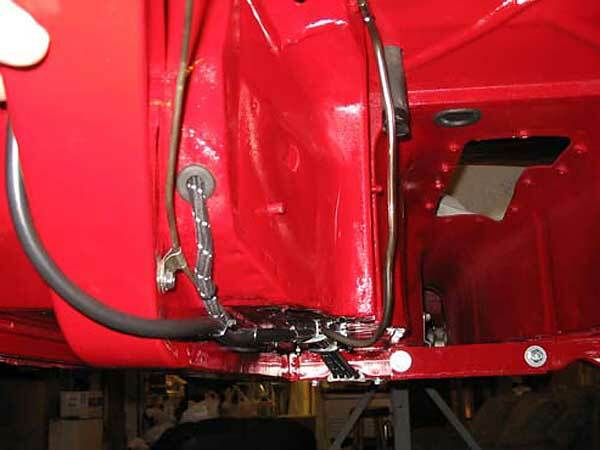 I measured and ordered a new rear wiring harness from British Wiring and had them add 48 inches to the standard length and leave the bullets off. I used the cloth cover, as I wanted to keep the original look. If you look under the car everything looks original, except for the route of the wire when it reaches the front of the foot well. NO WIRES IN THE ENGINE COMPARTMENT! This was my goal and it is really clean. I have decided to uses modern plastic auto wire connectors and eliminate the bullet connectors, altogether, under the bonnet platform lock area. This will make better connections and eliminate the mess. Other modifications included extending the wires for the alternator and coil to route through the left side radiator support. I plan on using looms to keep it clean and to keep wires away from hot metal. I added another wire for the temperature sensor mounted in the radiator. This is linked through a relay and I installed a toggle switch in the dash where the overdrive switch was originally mounted. I can manually override the temperature sensor and turn the fans on if desired. The last issue was running power to the Comp9. I ran the hot wire from the starter bolt to the Comp9 to supply power to the car. I will use the same hole that the rear wiring harness comes into the passenger compartment. Make sure it is wrapped and use a rubber grommet to keep the wires from rubbing on metal. I used ten-gauge to bring power to the Comp9. I will use a wire wrap as a second cover just to make sure no wire contacts metal as this is the power from the starter to the fuse panel. You could put an in-line fuse in place, but it would need to be at least fifty amps or greater for the entire car. I had also added the inertia switch and mounted it next to the Comp9 and it can be seen in the pictures. 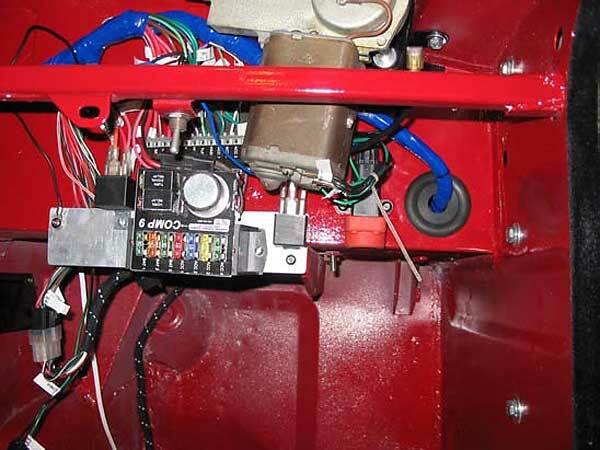 The other modifications include a toggle switch under the dash to kill the electric fuel pump manually. I use this when I park the car and leave it unattended. I also put in a small buzzer to let me know if the inertia switch has opened or if the toggle switch is left open. This came from Radio Shack and is very quiet so it should not be a major issue. The last modification was to add a four-way flasher. 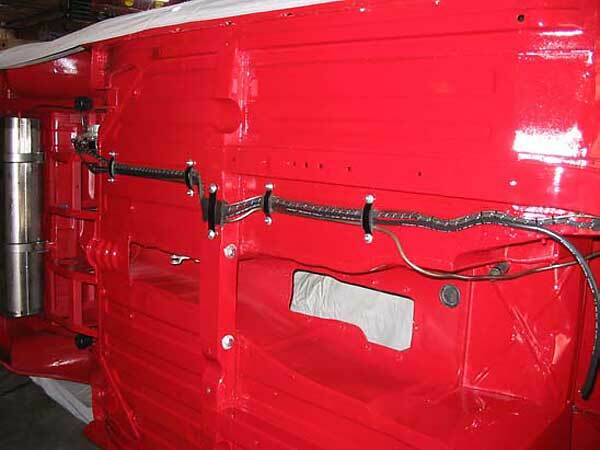 American Auto-wire has several complete kits available on their web site. They also sell the quick connectors that will eliminate the old unreliable bullet connectors. Buy a very good crimping tool for the connectors such as the one sold by British Wiring, as it is very well worth the investment. It crimps both the insulation and the wire at the same time; very handy. Good luck and hopefully this will keep you rolling down the road and the lights burning. James Jewell added: I was unable to find the Comp-9 on the American Autowire web-site. I suspect it has been replaced with a newer model. Have no worries, though. American Autowire continues to make several models of fuse/relay block. Disclaimer: This page was researched and written by Jeff Howell. Views expressed are those of the author, and are provided without warrantee or guarantee. Apply at your own risk. 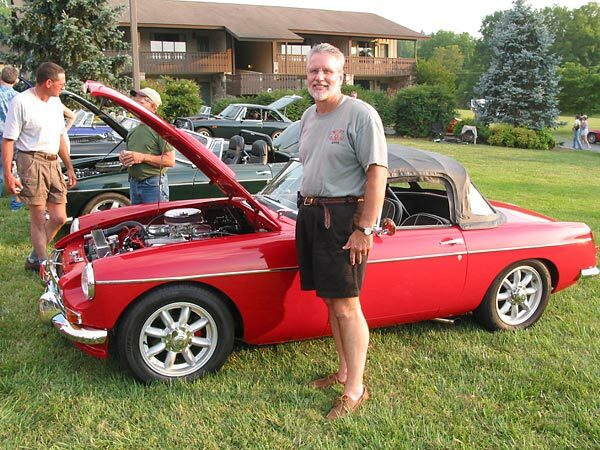 Note: If you like this article, you'll probably also like "Installing a Wiring Kit" by Greg Myer, which appeared in Volume XIV Issue 2 of the British V8 Newsletter.